What is Keto? What is LCHF? Who doesn’t love a cold, creamy milkshake? Well there is no need for you to miss out if you are trying to reduce your carbs, you can still enjoy a delicious keto shake. 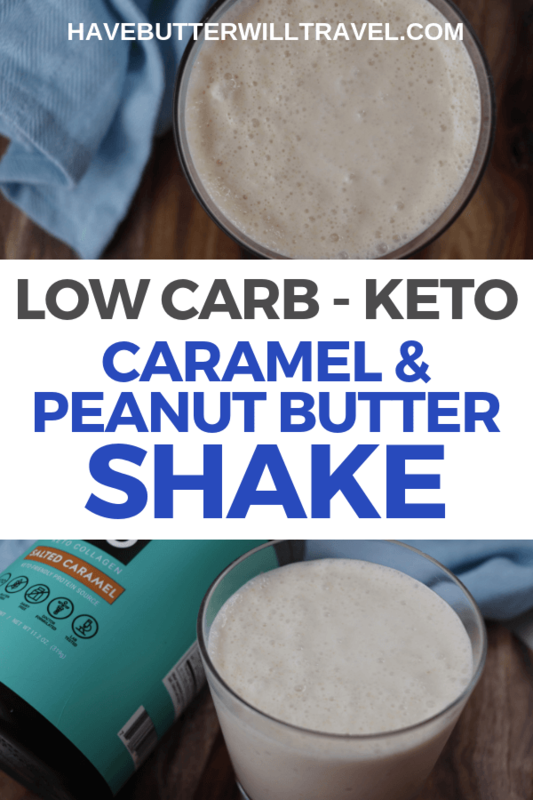 The combination of salted caramel and peanut butter is a real winner and this keto shake is super satisfying on a hot summer’s day or anytime really. Salted caramel is such a popular flavour at the moment, and we love that combination of sweet and salty. This keto shake combines the delicious flavour of salted caramel with one of our other favourite things – peanut butter. Adding nut butter for a keto shake or smoothie is a great way to add flavour as well as protein and fat. This makes the keto shake so filling that it will keep you going for hours. We used coconut mik in this recipe as we wanted a thick, decadent and creamy consistency. We prefer the canned variety (BPA free is possible) and always try to purchase a coconut milk that just has coconut as the only ingredient. If you wanted to lower the carbohydrates in this recipe you could substitute nut milk for the coconut milk. Try making your own almond milk, home-made nut milk is delicious! Did you know that we need sufficient levels of collagen in our body to ensure the proper function of our skin, hair, nails, muscles, tendons, ligaments, joints, bones, tissues, eyes, gut, heart and brain? Check out this ultimate guide to collagen for loads more information. Perfect Keto Salted Caramel Keto Collagen is made from grass-fed cows and contains 10g of collagen per serving, which is why we choose it. On top of that it also includes MCT oil which is our bodies preferred energy source. You can read more about MCT oils and how we use them here. 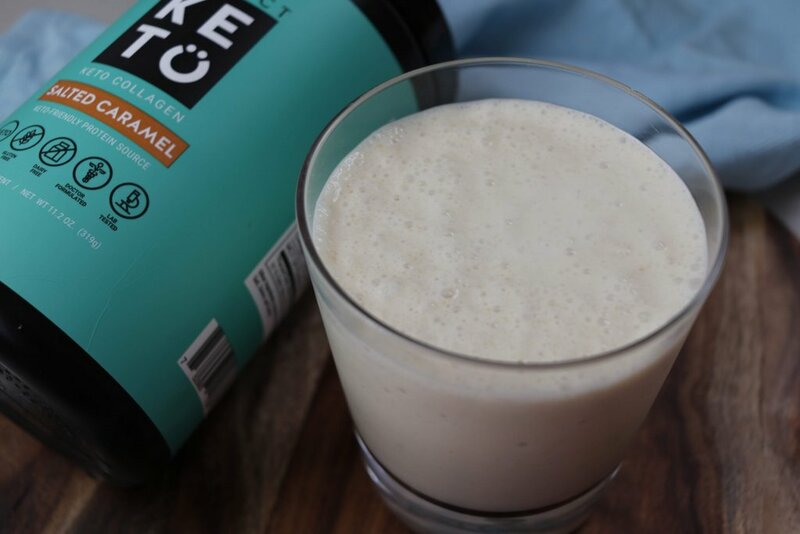 This salted caramel keto collagen is delicious in your morning coffee or to add to your favourite smoothie. We also love the chocolate keto collagen and use it in our chocolate smoothie, nutella fat bombs and creamy hot chocolate and the vanilla keto collagen in our coconut collagen fat bombs. Are you a coffee lover? If you are, like me, then you should definitely get on the salted caramel collagen bandwagon. A scoop of this in your coffee is absolutely creamy & delicious and you don’t need any other sweeteners or syrups at all. For coffee lovers, another alternative is to replace the water in this shake with cold brew coffee. Yes you heard me, go and do it now please. 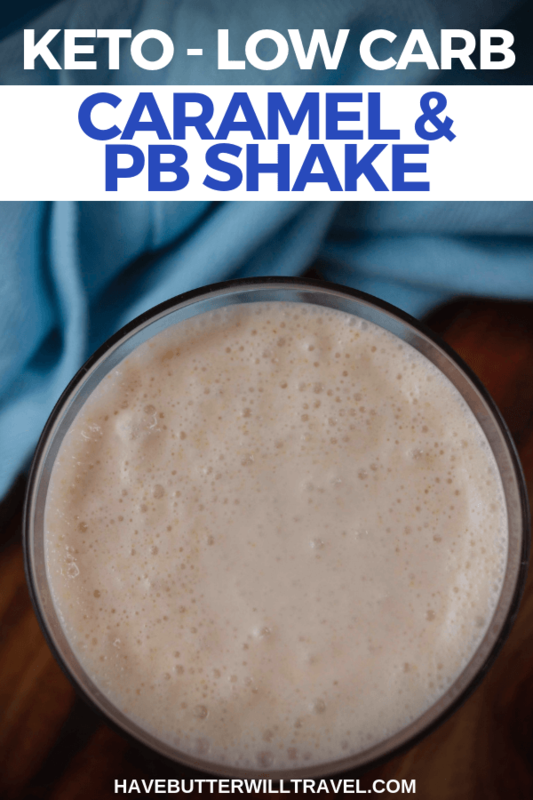 Having you been missing having a shake since being keto? 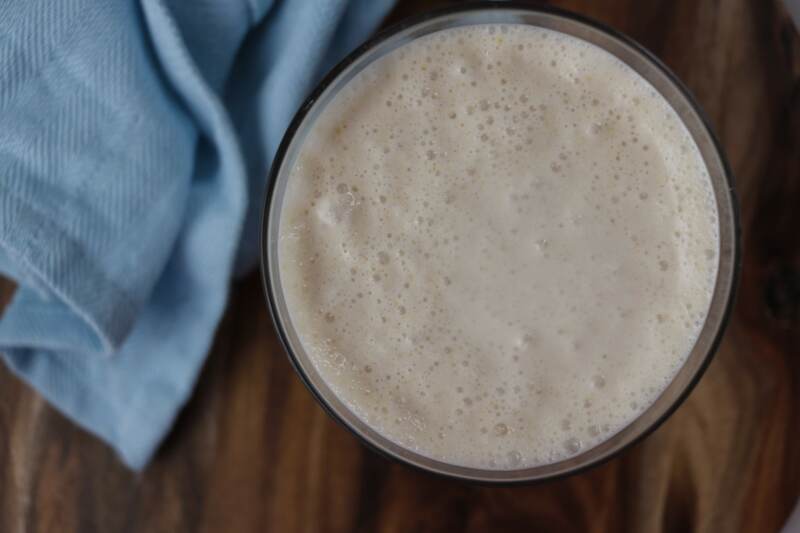 This caramel and peanut butter keto shake is even better than the real thing. Place all ingredients in a high powered blender and blend on high until combined. NOTE: THIS IS BASED ON THE INGREDIENTS WE USED, NUTRITIONAL INFORMATION MAY VARY DEPENDING ON THE INGREDIENTS USED. Tried this recipe?Mention @havebutterwilltravel or tag #havebutterwilltravel! Disclosure: The above post may contain affiliate links. We may earn a small commission from purchases made through these links, at no additional cost to you. Everything we recommend on our website are products we use and love. Thank you for supporting Have Butter will Travel and allowing us to share our low carb experiences with you.